each one in packaging designed to enhance the unique and prestigious characteristics of the mineral water inside. was designed for the high-end restaurant and hospitality sectors. It is classed as a luxury water. and by those who want high-quality water in attractive and refined packaging. There has also been attention to detail in the design of the logo and labels and their placement on the bottle. Precise parameters have been observed to give the bottle aesthetic balance. The label is equal in length to half of the bottle circumference and is perfectly positioned at the centre of the bottle. The perfect transparency and elegance of Dolomia Exclusive on the table, together with the purity and delicacy of the mineral water inside, make it unique and unmistakable, a real added value to increase enjoyment of the food and wine that accompany it. Acqua Dolomia works in a protected natural setting and makes choices that guarantee minimal environmental impact. From this mission came the choice to sell bottles from the Exclusive range in non-returnable glass. 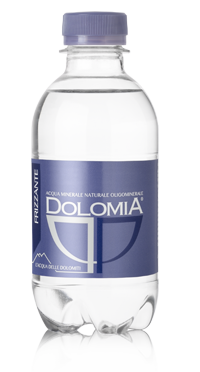 A choice that respects the uncontaminated territory where Dolomia water originates. The PET Elegant range. High quality water in stylish packaging. The high level of innovation that characterises Dolomia products is especially reflected in the Elegant range, aimed at the hospitality sector, HORECA sector as well as of anyone looking for a high quality water in stylish packaging. Available in four sizes: the practical 330mL, the innovative pocket-sized 250 mL, the perfect for on-the-go consumption 500 mL and 1 L that provides elegant look on the table due to its sleek shape. The packaging, designed for a clientele who are conscious of design as well as water high quality, is innovative due to the specific combination of a discreet and elegant label and a PET container from the minimal and essential design, but with the same consistency and transparency as the finest glass. The Elegant bottle was designed from a simple idea: the bottle’s shoulders follow the shape of an inverted Dolomia logo. The result was an innovative, elegant and recognisable silhouette, linked to optimum performance in terms of packing and storage. The Elegant range was designed to offer multiple benefits not only to the HORECA and hospitality sectors. Perfect also for on-the-go consumption and for those looking for high quality water in stylish packaging, The Dolomia Elegant range is an expression of Italian quality and beauty. So trendy, so Elegant!